Written by Christian Domittner, DC (Austria), winner of the 8th Edition of Tozando’s “Win a Trip to Japan” Experience. First of all, thank you, Tozando! You were all great hosts and everyone made me feel very special. I was so very lucky to have been the chosen winner. It was a great experience to be able to see Kyoto in the summer, especially having the opportunity to see the unique Gion Matsuri festival. Japan is a most interesting place to visit. It is impossible to see it all at one time. Japan is a country you have to visit multiple times to experience it in all 4 seasons. I am sure it will impress anyone, every time! The Japanese people are very pleasant, friendly and polite and I think we foreigners can learn a lot from their lifestyle. You can see the drive for perfection, harmony and passion. My trip to Japan started from Vienna, Austria and I arrived on the 13th of July around 07.00 in Tokyo. Then I took a bullet train to Kyoto which is something I think every tourist needs to experience, a train ride with a bullet train through Japan. I arrived at the Kyoto station around 13.00 where Yu Bo from Tozando picked me up and we decided to have lunch together before heading to the Tozando office. We had hand-made Soba noodles for lunch at a really nice restaurant near the Kyoto station. 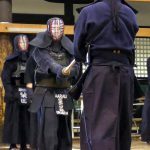 After which we headed over to the Tozando Nishijin store and main office where I met the members of the International Sales team in the marvelous display room full with Kendo Bogu. 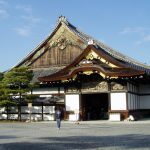 After a short chat with the members, Yu Bo took me to see the Nijo Castle with the famous nightingale floor and also Nishihongan-ji which is a very large temple famous for being established by Shogun Tokugawa Ieyasu and is also listed as a UNESCO World Heritage Site. After that, Yu Bo took me to check into the hotel that had been prepared for me, and this is where Yu Bo left me for the day. After a quick shower I went out to have some Yakitori, Asahi beer and Sake for dinner. After a satisfying meal, I ended up back in the hotel and read from Musashi’s book of “Five Rings” which I had brought with me until bedtime. The next day Yu Bo was to be my guide for the full day, and we knew it was going to be a busy day, so we began early in the morning. 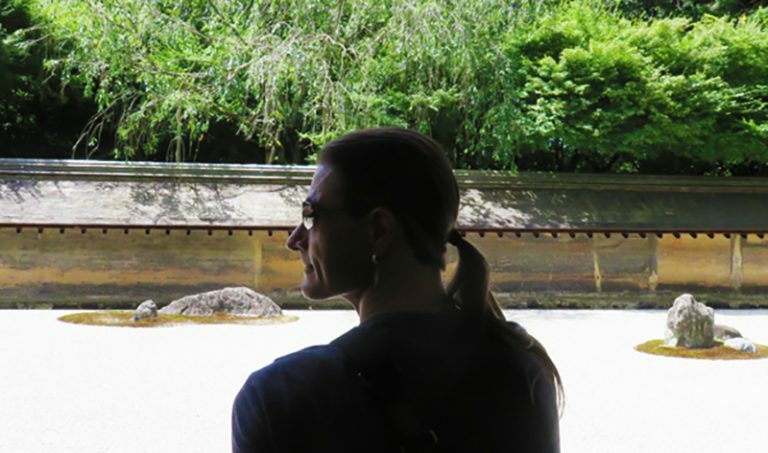 We met outside the hotel and took a bus to the northern parts of Kyoto where we first visited Ryoan-ji, where we sat down to take a rest and to gaze over the famous Zen rock garden. After this we walked along the path to arrive at Kinkaku-ji or the temple of the golden pavilion, which is also a UNESCO World Heritage Site. Hurrying along the way, our next destination was the Daitoku-ji temple, which I had requested to see as part of this trip when I was chosen as the winner. 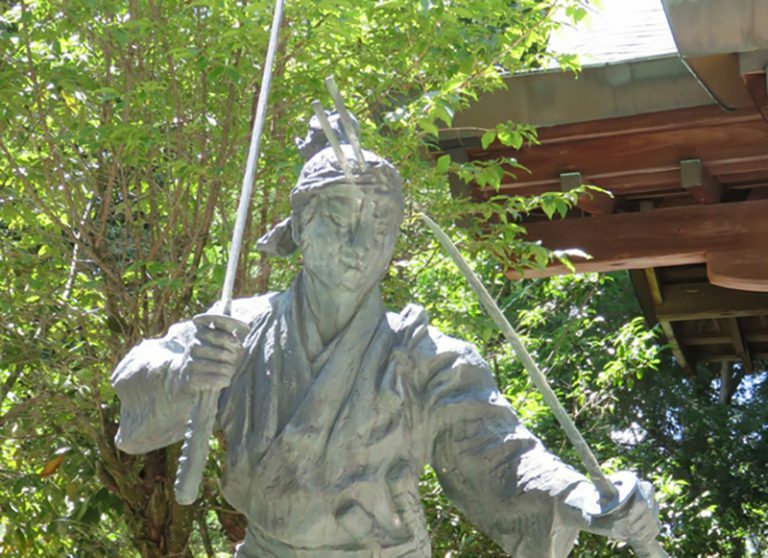 Since I have always wanted to go on a “Miyamoto Musashi Tour” and Daitoku-ji has a sub-temple named Daisen-in which is said to be where Miyamoto Musashi learned about Zen. So it was very interesting to sit in the same place where presumably Musashi also sat many hundreds of years ago and immerse myself in the Zen gardens there. Last on our list that day was to visit Ginkaku-ji, the Silver Pavilion, the temple was simple but it looked really splendid, but what impressed me most was the moss garden in the back area of the temple, just imagining how long it must have taken to become like this is truly mind boggling. It was definitely one of the most memorable places during my trip in Kyoto. 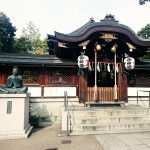 Since we were be able to finish early in the afternoon, I was also able to go and see the Shogoin and Kyoto Budogu Tozando Stores which are in the area around the Heianjingu Shrine and the International Budo Center. The antique swords and samurai armors in the Shogoin Store really left an impression on me. Since I also wished to do some private shopping and we ended the day with Yu Bo taking me to the Kawaramachi area, the central shopping area of Kyoto, where the Gion Matsuri was also being held on our way home, where we were also able to see the Floats that are used for the Gion Matsuri. According to Yu Bo’s pedometer, we apparently took about 30,000 steps that day, in other words, an eventful day in the hot summer weather in Kyoto! The following day Yu Bo was my guide for the day again but since he couldn’t be around early in the morning, we decided to meet and begin the tour around 11.00 in the morning. This day was dedicated to my hero Miyamoto Musashi. So we went on a complete Musashi tour and our goal was to walk the same path as he had many hundreds of years ago in Kyoto. So we again headed for the northern parts of Kyoto, our goal being the Ichijou-ji Sagarimatsu and the Hachidai Shrine. 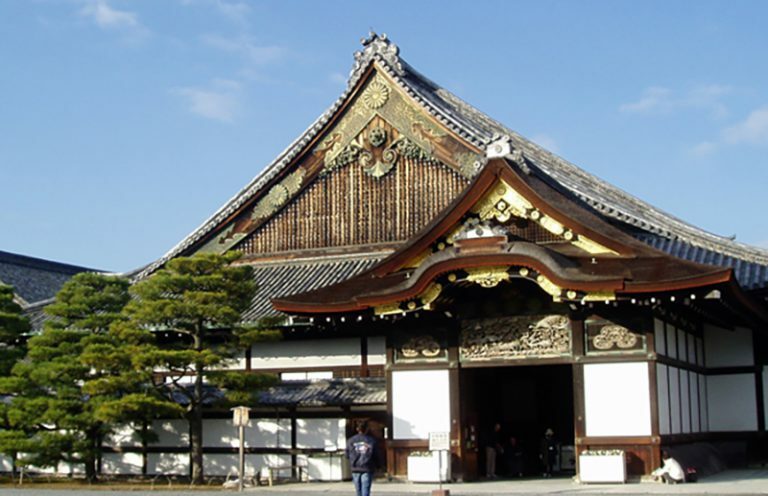 The Hachidai Shrine being the place where Miyamoto supposedly went to offer his prayers before his famous duel with the Yoshioka School, but in the last moment decided that he didn’t need the help of the gods and would rather depend on his own skill instead of depending on the gods. So I actually got to stand in the place where he realized better to rely on himself than on the gods. The Hachidai Schrine also had enshrined a piece of the original Sagarimatsu, the pine tree that was the place of the duel with the Yoshioka School. As far as I know, this duel was also the first time, where he used his Nito-ryu sword technique. What a great moment and memory! This was definitely one of the highlights of my trip! With the Musashi tour finished, we used the remaining time to visit the Ryozen Kannon Temple, to catch a glimpse of the huge Kannon statue before entering the Kiyomizu area, to see some of the most preserved areas of the ancient Kyoto. 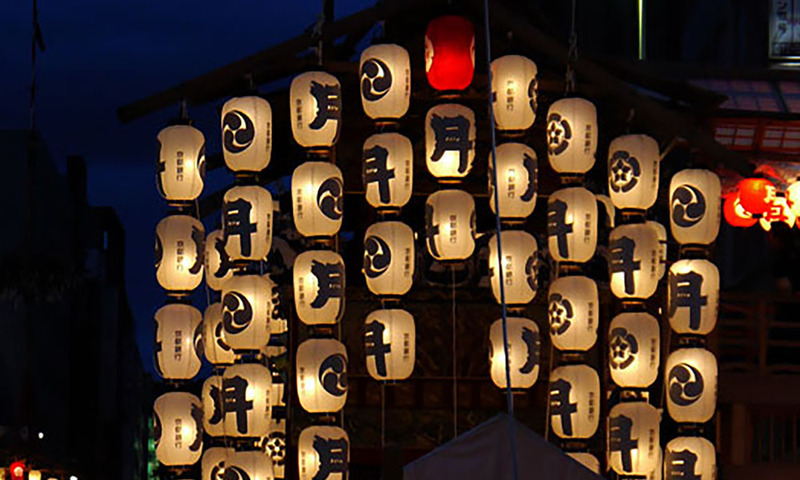 The Gion area and the Kiyomizu area are definitely worth to see since they have a distinct Japanese feeling to them which cannot be experienced in many other places. We did manage to get to the Kiyomizu Temple also, however, by the time we arrived they were unfortunately no longer selling any tickets to get inside anymore. As a small consolation, we had some Japanese sweets, called “Yatsuhashi” which was extremely delicious. Since we were going to meet up with the rest of the Tozando International Sales team that evening, we headed back to my hotel where I managed to take a quick shower and change for the Dinner. 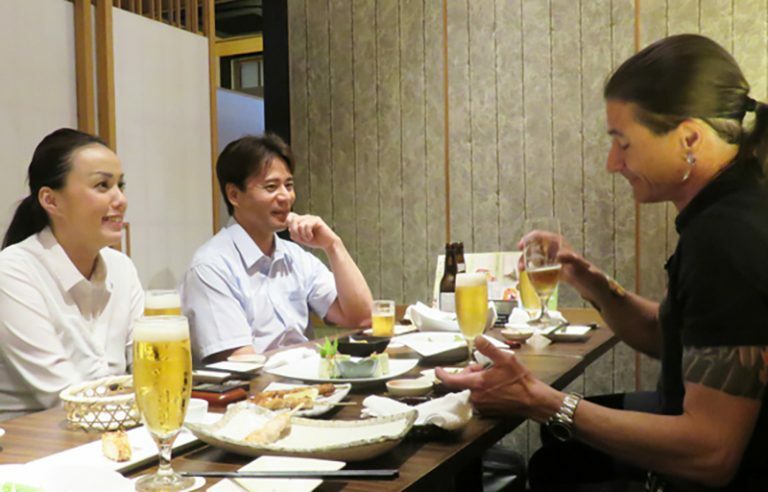 The Dinner was held in an Izakaya, which as I requested, had some great Japanese food and was in a private room so that we could talk freely undisturbed while having our meal. What a great evening it was and it was very pleasant to get to know all the members of the International Sales team. Great food, and marvelous company! Thank you for this opportunity to meet you! I had a lot of fun. I was also able to participate in festivities of the “Yoiyama” on the evening before the parade on the main event day of the “Gion Matsuri”. It was a little rainy, since a Typhoon was on its way to Kyoto that night. But there was a lot of people on the streets with a lot of small stalls with food and drinks, and one could even go into one of the Floats that are used for the parade, if you pay a entrance fee. I got to feel the Japanese festival mood during the Yoiyama and I have to say that it was unlike anything else I have experienced so far. 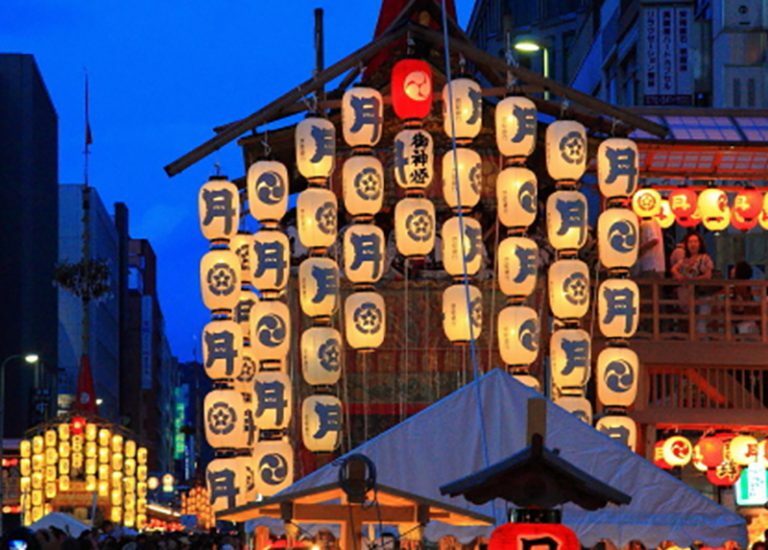 Luckily, the Typhoon went West in the end so even though there was talks that the Gion Matsuri might be cancelled the next day, they did proceed as scheduled! 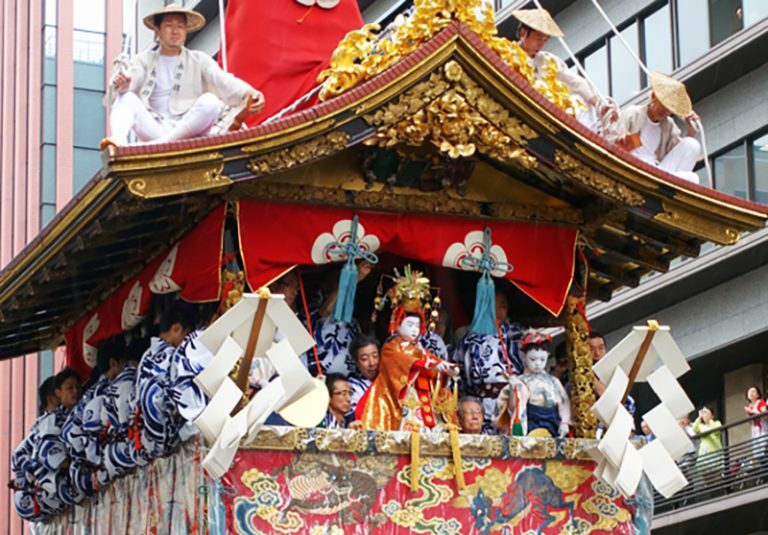 The main event for the Gion Matsuri, started at 9.00 in the morning and there were a lot of people there to see it. It did rain a little, so the Floats were protected with some plastic sheets covering the expensive brocades which hanged from the Floats, but it was still a very impressive event. Really, Wow! How they can maneuver those big wooden constructions (the floats) around in the 90 degree curves is beyond me! What a great ending to my journey! My last day I went with the bullet train to Tokyo and stayed overnight to catch my flight back to Vienna early on Sunday morning. Since I had 2 Shinken with me in my luggage, I expected it to take some time to get through the customs with it. It was really an interesting experience to export swords from Japan. Be ready, since you will attract some attention for sure, but with some patience, the right papers and 2 ½ hours of time for security check-in, it works. What a great country with great people! I LOVE JAPAN and I’ll be back! Lastly, I would like to give a special thanks to Yu Bo. Not only did he act the perfect tour guide, he was also great to talk with and knew a lot of places for great Japanese food. I feel really sorry for running him ragged through Kyoto in the 39°C summer heat. But I really enjoyed his company and hopefully, we will meet again in Japan or Europe. 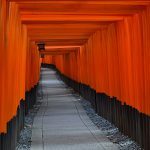 I still have to see Japan in the fall and winter and then I will have completed seeing this amazing country in all four seasons. Hopefully next time I will also bring my wife! 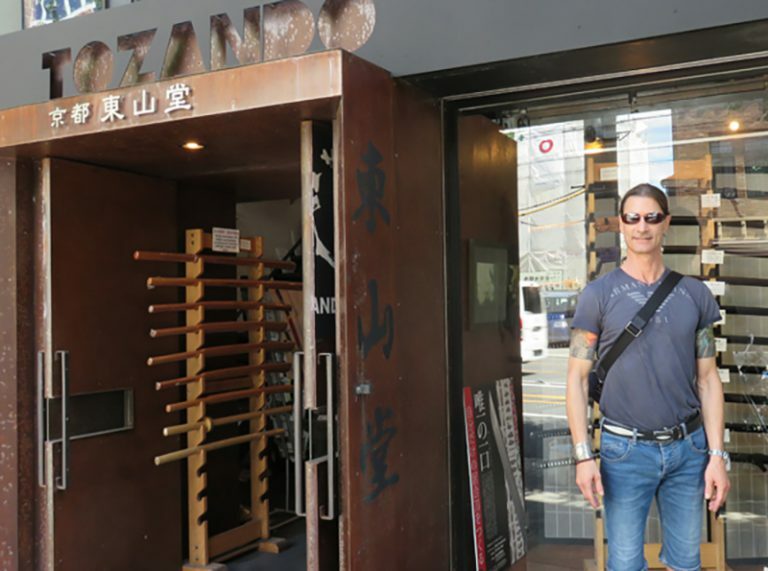 NEXT POST Next post: 2015/09/17 – Tozandoshop is under construction!